It’s one of food’s most beautiful relationships: pasta and sauce. But which came first—and how on Earth are you supposed to figure out which of those hundreds of shapes to serve with your pesto? With Valentine’s Day round the corner, we bring you the saucy—and occasionally scientific—history of an Italian staple. Listen in now as we take you from the very first mention of “a food of flour and water,” served “in the form of strings,” to the cutting-edge shape-shifting pasta of tomorrow. “You would think such a national treasure as pasta would be very well-documented,” said Maureen B. Fant, translator of Oretta Zanini de Vita’s Encyclopedia of Pasta, and co-author, with Zanini de Vita, of Sauces & Shapes: Pasta the Italian Way. 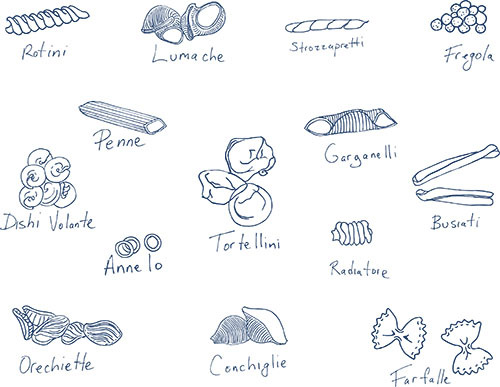 But, in fact, before the Encyclopedia‘s publication in 2009, there was no catalog of Italy’s hundreds of pasta shapes—not to mention the unique stories that lie behind each one. Food historian Oretta Zanini de Vita had investigated everything from Papal foods to the peasant cuisine of the Italian countryside, but she turned her attention to pasta when she realized that Italian culinary heritage was disappearing before her eyes. With Fant’s help, we trace Italian history—economic, colonial, industrial, religious, royal—through the invention of new pasta shapes and the development of pasta-making machinery, before ending up at Carnegie Mellon University to explore the science behind the flat-pack, self-assembling pasta of tomorrow. Alongside the story of shapes comes the question of sauces. Such Anglo-American staples as spaghetti bolognese or macaroni and cheese would make any right-minded Italian shudder in horror—but why? Is there any real logic to the “correct” pairing of shapes and sauces? Jacob Kenedy, chef and co-author of The Geometry of Pasta, talks tradition, texture, and the all-important relationship between surface area and emulsification. Meanwhile, in Italy, we savor tortellini en brodo, or tortellini served in broth—the time-honored pairing—before trying chef Massimo Ratti’s strawberry sauce-drenched version (Ratti’s own father reportedly cried over his son’s delicious transgression—and they were not tears of joy.) This episode we explore the pairing dilemma: Have you been matching your sauce with your pasta all wrong? Making tortellini at Trattoria Anna Maria, Bologna. Photo by Nicola Twilley. Maureen B. Fant writes, translates, and teaches—mostly about Italian food. She translated Oretta Zanini de Vita’s Encyclopedia of Pasta before collaborating with her to co-author Sauces & Shapes: Pasta the Italian Way. Forget spaghetti: a true bolognese ragu should be paired with egg tagliatelle. Illustration by Eric Lewandowski. Chef Jacob Kenedy is chef/patron at Bocca di Lupo, Gelupo, and Plaquemine Lock in London, and co-author, with designer Caz Hildebrand, of The Geometry of Pasta. Lining Yao is assistant professor at Carnegie Mellon University’s School of Computer Science, where she directs the Morphing Matter Lab. While a PhD student at MIT’s Media Lab, she collaborated with Wen Wang to develop the Transformative Appetite concept: edible 2D films made of gelatin and cellulose that transform into 3D shapes during cooking. She is now working to apply the same principle to a flour-and-water dough to create a true shape-shifting pasta. Toni Mazzaglia took us to Trattoria Anna Maria and Ristorante Ponte Rosso, she translated for us, and she even managed to reunite Nicky with the laptop she’d managed to leave in the back of a taxi on the way to one of those restaurants. Toni is, in short, a miracle worker. If you’re planning a trip to Italy, you need to take one of her amazing Taste Florence food tours. And, if you’re a journalist looking to report a story in Italy, Toni is the fixer you need: you can reach her here. We can’t recommend her highly enough! We visited Trattoria Anna Maria to enjoy their traditional Bolognese pasta and marvel at the talents of the sfoglini who make tortellini and other delicious fresh pasta shapes by hand, all day. Videos showing the sfoglini at Trattoria Anna Maria making tortellini and tagliatelle by hand. Videos made by Nicola Twilley. Chef Massimo Ratti is known for his creative but, to Italian traditionalists, heretical pasta creations. He serves tortellini with strawberry sauce and coffee grounds rather than broth, and lasagna with pine nuts and coconut rather than ragu—and the results are delicious. 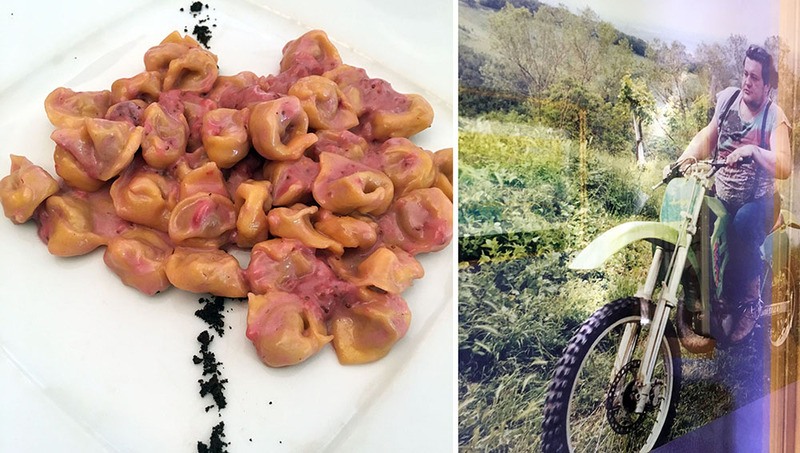 Massimo Ratti’s tortellini with strawberry sauce and coffee grounds; a poster of the chef on a motorbike hangs in the restaurant window! Photos by Nicola Twilley. Designer, photographer, and Gastropod listener Eric Lewandowski was kind enough to volunteer his services to help illustrate the pasta shape segment of our recent live show at the Boston Museum of Science. You can find more of his gorgeous work and his contact details here. The post Remembrance of Things Pasta: A Saucy Tale appeared first on Gastropod.